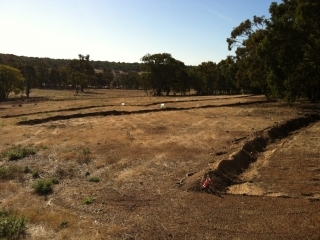 When people think of good permaculture plants – or even good garden plants – for Perth’s Mediterranean climate, pineapples don’t generally leap to mind. At a guess, I would say that most people have never considered that they could grow pineapples. It’s a shame, because pineapples actually love the heat and the sun here, and will grow in marginal areas and thrive on very little water. Pineapples will also grow quite happily in pots, so they can be moved if necessary. The pineapple plant, Ananas comosus, is a tropical herbaceous perennial. It grows up to 1.5m tall, and the same across, although usually it won’t get taller or broader than 1m. The plant has a short, sturdy stem and narrow, waxy leaves 30 – 100cm long, often with sharp spines along the edges. In the first year of a pineapple plant’s life, the stem lengthens and thickens, bearing numerous leaves in close spirals. After about 12 to 20 months, the stem grows into a spike-like inflorescence up to 15 cm long, holding over 100 spirally arranged flowers. Flower colours vary, depending on variety, from lavender through light purple to red. The ovaries develop into berries which coalesce into a large, compact, multiple accessory fruit. 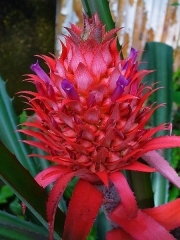 A pineapple plant flowers only once, when it is 18 – 24 months (i.e. 1.5 – 2 years) old, and produces one fruit before it dies. The fruit takes about 6 months to develop after flowering. Pollination, generally by bats or hummingbirds, is required for seed formation – but the presence of seeds negatively affects the quality of the fruit. Seeds, if present, are in the fleshy part of the fruit just below the rind. 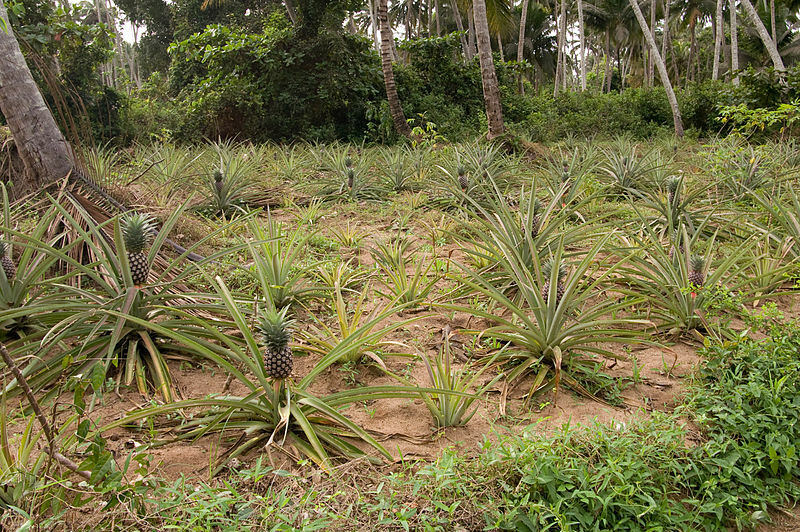 Vegetative reproduction is more common, via slips, suckers, and pineapple tops. Suckers, also sometimes called ‘pups’, are little side shoots that are produced in the leaf axils (between the leaves) of the main stem. Some varieties will produce more suckers than others, some will start earlier and others later. But they all produce at least a few suckers before they die. If you leave the suckers in place you get what is called a “ratoon crop”. That is the least amount of work for the next crop, just do nothing, but it has a few disadvantages. The plants start getting crowded, and compete for food, light and water. The result of this is that the next crop of fruit is much smaller. The other disadvantage is that if you leave the suckers in place you only get a few suckers and the original pineapple plant, having successfully reproduced, dies. If you keep taking the suckers off, the plant will survive longer and continue growing more suckers. The timing is not critical. Even tiny baby plants can survive, although it is best to wait though until they are a reasonable size, say about 20 cm long. Plants grown from suckers will flower in about 18 months. Slips are the tiny plantlets that grow at the base of the fruit on the fruit stalk. Not all pineapple varieties produce slips. Slips can be carefully snapped or pulled off. Do it as soon as they are big enough to handle (say about 10 to 15 cm) because slips develop at the expense of the fruit. The parent plant will not produce more slips if you take them off as it would with suckers. Plants grown from slips can fruit within a year. The easiest way to grow a pineapple is from a pineapple top. Cut the spiky top off of a pineapple fruit, and make sure you remove all the flesh, and even some of the small lower leaves from the pineapple top. Some people recommend allowing the pineapple top to dry for 3 or 4 days, but it isn’t really necessary. Just make a small hole in the ground or in some good quality soil or potting mix in a pot and stick the base of your pineapple top in that. Push the soil back in and firm it around the base so the pineapple sits straight and doesn’t fall over. 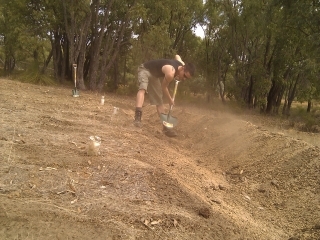 If the soil is dry give it some water. It’ll grow. It’s that easy. Water the young plant regularly for the initial six to eight week establishment period, and provide a very dilute organic foliar fertiliser spray. After that, the pineapple plant will thrive even with very little water and attention. 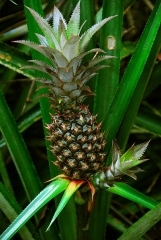 Plants grown from pineapple tops will take 20 – 24 months to flower, and then another six months or so before the fruit is ripe. The fruit is ready to pick when it starts to turn yellow. You can pick the fruit at this point, especially if it is getting sunburned or is in danger from animals, and leave it in a cool, dry place (e.g. on the kitchen bench) for a few days. Otherwise leave the fruit on the plant until it’s fully ripe and yellow. Water – about 700 to 1000mm rain or irrigation annually, although they can survive and fruit with much less. They have very tough leaves so they don’t lose much water through evaporation. Sunlight – In cooler climates, pineapples need a lot of sun. In very hot climates they like growing under a bit of shade. In Perth they will thrive in full sun or part shade, but they do appreciate being protected from the hot Westerly afternoon sun. 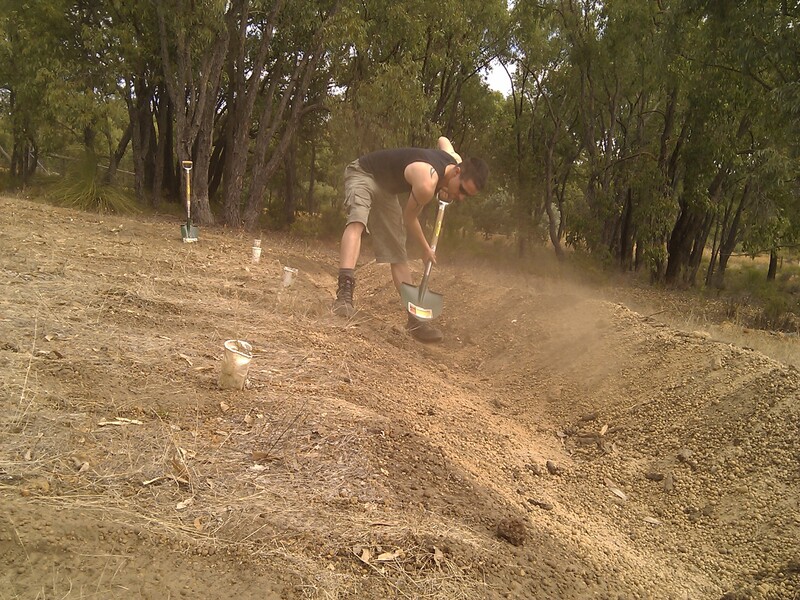 Soil – Pineapples don’t need much soil or high quality soil, although they do prefer it to be slightly acidic. They do not have a big root system, and get a lot of their nutrients through their leaves. Pineapples do need good drainage – the surest way to kill a pineapple plant you are trying to grow is overwatering and rot. Pineapples also appreciate thick mulch, and a good compost. Mix compost in with your soil before you plant the pineapple, and then mulch thickly around it. You end up with mulch and compost sitting in the bottom leaves, and as it breaks down it feeds the plant. 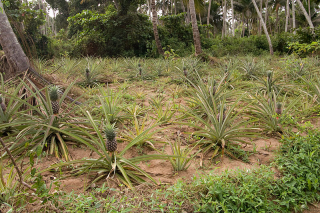 Food (Fertiliser) – Pineapples take up a lot of their nutrition through their leaves, and the first few months after planting they rely only on their leaves. You should make sure the plant food actually lands on the leaves. Artificial and concentrated fertilisers will burn the leaves, so it’s best to stay away from them. You can use liquid fertilisers like fish emulsion, seaweed extract, or worm tea. Make a very diluted solution and apply it to the pineapple plant’s leaves and the surrounding soil with a watering can or spray bottle. The colour of the leaves of your pineapple plant will tell you how healthy it is. If they have a reddish, purple tinge then your pineapple is starving and you should help it a bit with some liquid fertiliser. Space – Pineapple plants can grow up to 1.5m tall and 1.5m across. Make sure you put them in a place where they can spread without becoming a nuisance. They work well planted in clumps. 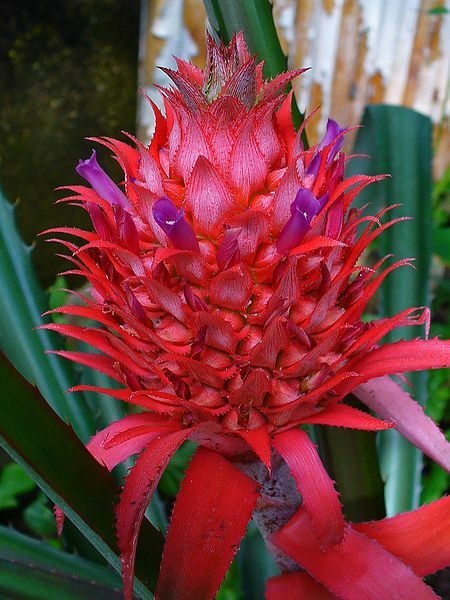 Pineapples produce beautiful flowers, and their unusual look can make a very attractive focal point in a garden. Fruit from your own homegrown pineapples will taste better than anything you can buy at a supermarket, and it will be free of pesticides, herbicides, and other nasty chemicals. Pineapple plants also produce more pineapple plants, with very little effort on your part. The spiky leaves and shallow, fibrous roots of a dense planting of pineapple plants makes an effective mulch-trap, preventing soil and mulch form being washed away by rain or irrigation, and slowing down the movement of water down a slope. 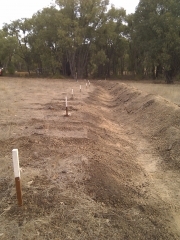 The lee side of this sort of soil dam will build up rich loads of humus, which benefits the pineapples and any other plants in the area.